On the 40th anniversary of Earth Day April 22, many seasoned environmentalists are left wondering how, in recent decades, so little has actually been accomplished. While environmental awareness has seeped into mainstream U.S. society since the 1970s — the era when 20 million people hit the streets on Earth Day to demand action — the structures of power remain largely the same. The mass mobilizations around the original Earth Day helped spur then-President Richard Nixon to sign a series of ambitious environmental laws that helped to clean contaminated waterways, save the bald eagle from the ravages of pesticides and began to clear the air, which in the early 1960s was so polluted that people were passing out all over our cities. Most environmental victories since then have benefited from those changes in the law, but more fundamental changes seem as distant as ever. Today’s environmental movement is floundering, even though the stakes are even higher. While local grassroots campaigners continue to fight for endangered forests, challenge polluting companies in their communities, and confront the coal industry’s assaults on the mountains of southern Appalachia, the best known national organizations can point to few recent victories. And they have failed to demonstrate meaningful leadership around what climatologist James Hansen calls the “predominant moral issue of this century”: the struggle to prevent the catastrophic and irreversible warming of the planet. As British journalist Johann Hari reported in The Nation in his article, “The Wrong Kind of Green,” in March, this is partly the result of a legacy of corporate-styled environmental organizations teaming up with the world’s most polluting companies. In response to the climate crisis, we have seen unprecedented collaboration between large environmental organizations and corporations seeking to profit from new environmental legislation. For example, the Climate Action Partnership (known as USCAP) has brought Alcoa, DuPont, General Electric and General Motors together with the Natural Resources Defense Council, the Environmental Defense Fund and the Nature Conservancy to push for the “market-based” approach to climate legislation known as “cap-and-trade.” This policy — which passed the U.S. House last year — would put a cap on the total amount of pollution, then allow businesses limiting their carbon dioxide emissions to sell “permits to pollute” to dirtier companies. This would create a vast, highly speculative market in carbon credits and offsets, with gigantic perks for corporations and little benefit for the planet. The push for cap-and-trade legislation has receded for now under pressure from both right wing anti-tax fanatics and market-skeptical environmentalists, but Washington observers now anticipate an even worse Senate climate bill, to be announced later in April, which will be laden with far more blatant giveaways to the fossil fuel and nuclear industries. It begs the question — where has the environmental movement gone wrong? To everyone’s surprise, Earth Day turned out to be the largest outpouring of public sentiment on any political issue to date. It drew public attention to environmentalism as a social movement in its own right, perhaps for the first time. And it set the stage for the public to pressure Congress to pass 15 major national environmental laws over a 10-year period, including the Clean Air and Clean Water Acts, the Safe Drinking Water Act, the Endangered Species Act, Toxic Substances Control Act and the establishment of the U.S. Environmental Protection Agency (EPA). The origin of those 1970s environmental laws also has an underappreciated back-story. Throughout the 1960s, people were responding with horror to the increasingly visible effects of smog, oil spills, pesticide contamination and other environmental assaults. Local governments responded by implementing their own, sometimes far-reaching programs of environmental monitoring and enforcement. Creative environmental lawsuits established important and unanticipated precedents, extending the right of citizens to sue to protect ecological values and furthering judicial review of the actions of government agencies. Far from an interference with business prerogatives, environmental regulation by the federal government became a way to allay public concerns while offering corporate America a menu of uniform and predictable environmental rules. The laws passed in the aftermath of Earth Day helped fund essential public works projects, such as the construction of sewage treatment plants, and offered protections for public health and biodiversity — but they also routinized and standardized the permitting of most industrial facilities. Most important, federal rules often pre-empted states and localities from enforcing regulations more stringent than those advanced at the national level; this core principle of federal pre-emption has again reared its head in today’s Congressional debate over climate legislation. This shift in the character of the most nationally visible environmental groups spelled the end of bold new policy initiatives on behalf of the environment. An environmental mainstream adapted to “insider” politics proved incapable of sustaining even a moderate Congressional consensus in favor of environmental protection, and ultimately helped prepare the stage for the anti-environmental backlash of the 1980s and beyond. The largest environmental groups launched direct mail appeals that brought in vast new funds, reflecting people’s outrage against the Reagan administration’s anti-environmentalism. Ironically, the success of these appeals pushed many groups further toward a conspicuously top-down, corporate-style structure. Those advocating a more corporate style invariably won internal battles within the Sierra Club, Friends of the Earth and even Greenpeace. They increasingly avoided issues and tactics that might prove alienating to wealthy donors. Environmental groups also began their flirtation with corporate sponsorships, so aptly summarized by Johann Hari in The Nation. In the lead-up to the 20th anniversary of Earth Day in 1990, activists (including this author) began closely investigating those ties, and revealed links between groups such as the National Wildlife Federation, Sierra Club and the Wilderness Society, and a rogue’s gallery of major oil, chemical, utility and banking corporations. The Multinational Monitor explored links between environmental organizations’ directorships and corporate boards, university researchers scrutinized the big environmental groups’ stock portfolios, and others explored the even more nefarious ties that tainted the world of “progressive” foundations. By 1990, everyone seemed to want to be an environmentalist. President George H. W. Bush proclaimed himself a defender of the environment and briefly aimed to distance himself from the anti-environmental excesses of the Reagan years by adopting the first national cap-and-trade system to address the problem of acid rain. Sen. Al Gore (D-TN), the 1988 presidential primary campaign’s leading Democratic war hawk, began speaking out about global warming and other environmental threats. Britain‘s reactionary Prime Minister Margaret Thatcher called herself a “green.” Even the president of the World Bank won praise from environmental publications for voicing concerns about the bank’s role in environmental destruction. The Environmental Defense Fund led the way in pushing for a more aggressively “market-oriented” approach to environmental policy. So, it was not a huge surprise when the celebrations of the 20th anniversary of Earth Day in 1990 became the coming-out party for a more overtly corporate brand of environmentalism. Earth Day celebrations became a virtual extravaganza of corporate hype, and “green consumerism” was the order of the day. The official overriding message was simply “change your lifestyle,” by recycling, driving less and buying green products. And while the national Earth Day organization turned down some $4 million in corporate donations that did not meet its rather “flexible” criteria, celebrations in several major U.S. cities were supported by notorious polluters such as Monsanto, Peabody Coal and Georgia Power. Everyone from the nuclear power industry to the Chemical Manufacturers’ Association purchased full-page advertisements in newspapers and magazines proclaiming that, for them, “Every day is Earth Day.” Through a variety of marketing schemes, corporations tried to paint themselves “green” (a practice known as “greenwashing”), while doing very little to actually reduce their impact on the environment. 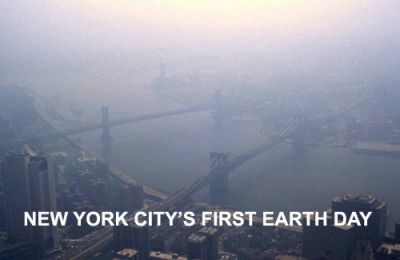 The 1990 Earth Day Wall Street Action reflected the flowering of grassroots environmental activity that had emerged throughout the 1980s, partly in response to the compromises of the big environmental groups. The popular response to toxic chemical pollution — launched by the mothers of sick children living near the severely polluted Love Canal in New York — grew into a nationwide environmental justice movement that exposed the disproportionate exposure of communities of color to toxic hazards. Earth First! grew as a decentralized network of grassroots forest defenders, using theatrical direct action, combined with acts of industrial sabotage to stem the tide of forest destruction. Others joined in solidarity with indigenous peoples’ movements around the world that had arisen in defense of traditional lands, responding to the new onslaught of neoliberal development policies. During the lead-up to Earth Day 1990, a hundred environmental justice activists signed a letter to the eight largest national environmental organizations criticizing the dearth of people of color on those groups’ staffs and boards, along with their increasing reliance on corporate funding. The Clinton-Gore administration of the 1990s perfected the art of channeling environmental rhetoric while simultaneously encouraging increased resource extraction — prefiguring Barack Obama’s recent overtures to the nuclear, oil and coal industries. As the decade ended, environmental activists made a strong showing in Seattle as a key part of the broader coalition of social justice, labor and green groups that successfully challenged the World Trade Organization in 1999. While many of the grassroots initiatives of the 1980s and 1990s continued (see Douglas Bevington’s new book, The Rebirth of Environmentalism: Grassroots Activism from the Spotted Owl to the Polar Bear), others felt dismayed by the ineffectiveness of large environmental groups. This led to the continued evolution of Earth First! and other radical environmental groups that focused on direct action tactics instead of lobbying and policy making. 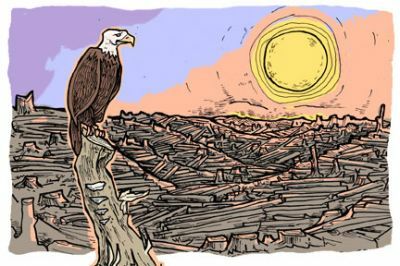 In the late 1990s, groups like the Earth Liberation Front shifted toward more secretive and aggressive types of property destruction and sabotage in defense of nature. Under G.W. Bush in 2006, the FBI announced that “environmental terrorists” were the top domestic security threat, even though no humans or animals had been harmed in any of their actions. In what became known as the “green scare,” federal law enforcement agencies targeted the most radical members of the environmental movement, leaving a chilling effect on the larger green movement. At least 16 eco-militants and animal rights activists landed in federal prison, replete with “terrorism enhancements” to their sentences, as a consequence of Bush’s notorious USA Patriot Act. Also in the early 2000s, renewed grassroots campaigns aimed to reclaim urban spaces and challenge the genetic engineering of food, among many other new issues. Over the last few years, it appeared that the climate crisis might be ushering in a renewed wave of grassroots environmental action in the United States. A 2009 student environmental conference attracted some 3,000 participants to Washington, D.C., and the event was followed by a symbolic blockade of the city’s large coal-fired power plant. On the 10th anniversary of World Trade Organization protests in Seattle on November 30, 2009, climate justice actions across the United States included the lock-down of an intersection outside the Chicago Climate Exchange (home of the corporate-driven “voluntary” carbon market), a blockade of a major component for a new coal-fired power plant in South Carolina, protests of large banks that finance the coal industry and other mega-polluters, and a rally outside Natural Resources Defense Council offices to protest the group’s aggressive advocacy for carbon markets. People in West Virginia and across southern Appalachia have stepped up resistance to the ravages of mountaintop removal coal mining, while others across the country — from Vermont to the Navajo Nation — have redoubled their efforts against Obama’s planned expansion of the nuclear industry. Most of 2009’s climate actions, however, were aimed at trying to influence U.N. member countries to reach a comprehensive agreement at the December U.N. climate conference in Copenhagen. The failure of diplomacy in Copenhagen deflated the energy of many activists, and the post-Copenhagen resurgence of climate actions has yet to materialize. Meanwhile, although Earth Day has become an annual ritual in some communities, as well as on many college campuses, the upcoming 40th anniversary has brought a notable scarcity of attention. One event this year, just highlights how quickly corporate environmentalism has evolved from tragedy to farce. On the eve of Earth Day on April 21, participants in a “Creating Climate Wealth Summit” will attend a glitzy gala event hosted by the Carbon War Room, an exclusive alliance of elite environmentalists and financiers headed by the notorious multi-billionaire Richard Branson of the Virgin Group. Branson is most celebrated these days for his experimental biofueled airplanes, along with a venture to promote outer-space tourism and public advocacy for geoengineering the planet. For only $450 (a third less for nonprofits), participants can have dinner with Branson, EPA Administrator Lisa Jackson, and founding Earth Day organizer Denis Hayes at the new Ronald Reagan International Trade Center, just around the corner from the White House. Meanwhile, the green marketing of products is alive and well, from clothing, to Priuses, to luxury ecotourism. The U.K.’s Guardian reported from a “green business” conference in London last year that “as much as 70 percent of future advertising would have an environmental focus.” They quoted a leading British supermarket executive questioning environmental limitations on consumer desires, arguing that such an approach simply “fails to see the enormous potential of consumers.” Another Guardian story reported on a Dutch study of consumer behavior, suggesting that ethical consumer choices are made chiefly for the added social status they confer. “Researchers found consumers are willing to sacrifice luxury and performance,” for example by buying a Prius instead of a Hummer, “to benefit from the perceived social status that comes from buying a product with a reduced environmental impact,” they reported. Today, right-wing pundits depict environmentalism as an elite hobby that threatens jobs, while many progressive environmentalists cite the potential for “green jobs” to help reignite economic growth. Both views are sorely missing a central element of what has made environmentalism such a compelling counter-hegemonic worldview ever since the 1970s: The promise that reorienting societies toward a renewed harmony with nature can help spur a revolutionary transformation of our world. This outlook has helped inspire anti-nuclear activists to sit in at power plant construction sites, forest activists to sustain long-term tree-sits, and environmental justice activists to stand firm in defense of their communities. People around the world are acting in solidarity with indigenous peoples fighting resource extraction on their lands. With climate chaos looming on the horizon, such a transformation is no longer optional. Our very survival now depends on our ability to renounce the status quo and create a more humane and ecologically balanced way of life. Brian Tokar is a director of the Vermont-based Institute for Social Ecology and a participant in the climate justice networks Climate SOS and the Mobilization for Climate Justice. He is the author of several books, including Earth for Sale: Reclaiming Ecology in the Age of Corporate Greenwash (South End Press, 1997), which is the source of many of the quotes in this article. New York City threw a large street party April 22, 1970, as part of the first ever national Earth Day teach-in and celebration. It was estimated that some 100,000 people joined the Earth Day festivities in Manhattan. In an unprecedented move, then-Mayor John V. Lindsay closed Fifth Avenue to traffic from Union Square Park to Central Park for two hours, essentially leaving Midtown traffic in gridlock. An “ecological carnival” took place on 14th Street between Third and Seventh avenues. New York Governor Nelson Rockefeller rode a bicycle to the Union Square rally and later signed legislation creating the New York State Department of Environmental Conservation. At the time, the fair was considered the largest demonstration in Union Square since the socialist rallies of the 1930s. Hot environmental issues at the time included addressing air pollution, municipal waste, noise pollution and the contamination of the Hudson and East rivers. Authorities did not yet know about the massive Newton Creek oil spill until 1978, where some 17 million gallons of oil were leaked into the creek between Long Island City and Greenpoint by Exxon Mobil’s predecessor in the early 1950s — becoming the nation’s worst oil disaster. In an effort to address urban traffic, Mayor Lindsay promised $1 billion dollars over 10 years to develop 12 additional subway tunnels and improve public transportation and said the city would be “discouraging automobile use in the central business areas, particularly,” Lindsay said. Forty years later, Mayor Michael Bloomberg has followed suit by closing down sections of Broadway to vehicles, temporarily closing streets in summer, and advocating a fee for people driving into Manhattan. Severe smog inversions took place in the city in 1948, 1963 and 1966, when 168 people died. People developed asthma and other health issues at alarming rates. In addition to car pollution and the burning of heating oil, the incineration of garbage was the largest contributor to air pollution in the city. In the 1960s, one-third of the city’s garbage was burned in some 17,000 apartment building incinerators and 22 municipal incinerators, in which emissions were not regulated. Earth Day helped raise awareness about how the incinerations contributed to poor air quality, and by 1992, the last municipal incinerator was closed. The Fresh Kills landfill on Staten Island was used by the city from 1947 until 2001 when it was closed by Mayor Rudolph Giuliani. Now the city transports garbage out of the city at a cost of more than $1 billion annually. The city is still developing a comprehensive municipal garbage disposal plan, which has been stalled by communities who feel that increased truck traffic and refuse transfer stations will adversely affect their neighborhood. The Hudson River was one of the most polluted waterways in the United States due to the dumping of garbage and industrial waste directly into it since the Industrial Revolution. In the 1960s, swimming was banned in parts of the river. From 1947 to 1977, General Electric discharged up to 1.3 million pounds of polychlorinated biphenyls (PCBs) into the river at its Hudson Falls and Fort Edward facilities. In 1984 the U.S. Environmental Protection Agency declared a 200-mile stretch of the river to be a Superfund site — a designation given to the nation’s most toxic sites. Due to years of challenges and delays, General Electric did not start cleaning up the river until May 2009. In a speech at the D.C. festival, Earth Day national organizer Denis Hayes, 25, made it clear that Earth Day 1970 was just the beginning. “We are building a movement, a movement with a broad base, a movement which transcends traditional political boundaries,” Hayes said. “It is a movement that values people more than technology, people more than political boundaries, people more than profit.